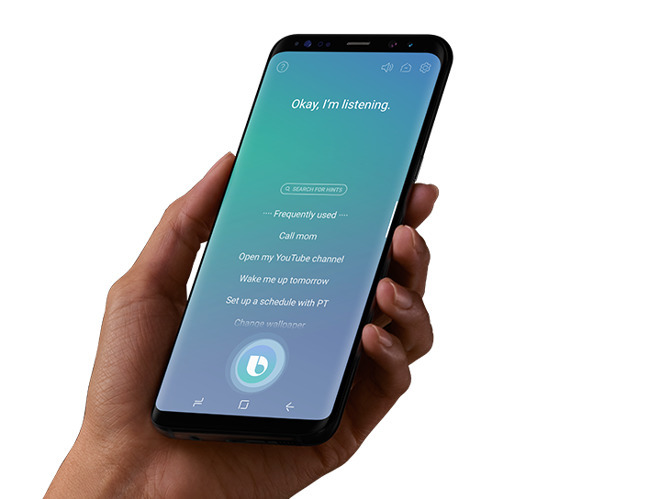 Samsung on Wednesday announced that Bixby, its equivalent of Apple's Siri, is now available on U.S. versions of the Galaxy S8 and S8+ —roughly three months after the phones first launched. An update is rolling out to S8 owners on AT&T, Sprint, T-Mobile, Verizon, and U.S. Cellular, Samsung said. Bixby has been available on South Korean versions of the phones from the beginning, but until now there was no English translation, despite a dedicated Bixby button being built into every unit. Indeed the assistant remains unavailable in other English-speaking countries such as Canada and the U.K.
Bixby is in theory capable of more voice commands than Siri, including app and hardware controls that are touch-only on Apple devices. This should extend to at least some third-party apps —Google has enabled the technology for Maps, Play Music, and YouTube. Driven partly by the assistant's absence in most countries, a number of coders have been modifying Samsung software to let people remap the Bixby button. Samsung, though, has been deliberately crippling these modifications. Apple is planning at least a handful of Siri improvements in tandem with this fall's iOS 11, including translation, more natural voices, and cross-device sync. The company could potentially have more Siri upgrades waiting in the wings, given plans to launch the HomePod in December. That device will have to compete against cheaper smartspeakers from Amazon and Google, both of which have assistants typically considered more advanced than Siri. Samsung is rumored to be working on a Bixby speaker.